The Ethereal AS-RC3260 Rolling Cart was designed for use with the Audio Solutions 2.1 or 3.1 Audio Mount. 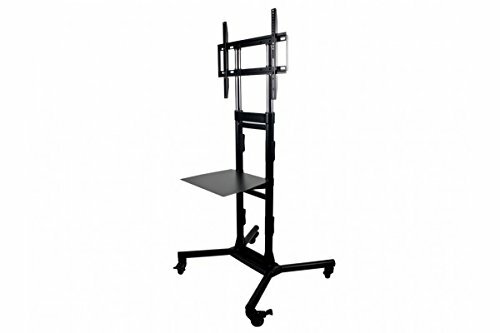 This cart will also work directly with most 32 to 60 inch Plasma, LCD and LED televisions with a maximum weight of 132lbs (60kg). This sturdy, ultra-portable unit is ideal for office, school, hospital and trade show applications. Move your screen easily from room to room, placing it exactly where you need it. It comes with locking wheels for safety, or use the included leveling feet for a more permanent installation. It includes a sturdy metal tray to hold a laptop, DVD player or other accessory. Cable clips route cables from the television to the floor, keeping your cables organized for a clean look. If you have any questions about this product by Ethereal, contact us by completing and submitting the form below. If you are looking for a specif part number, please include it with your message.